As much as coffee feels like a total godsend, especially after a sleepless night, the high caffeine content can actually keep you up at night: consuming more than 500 to 600 mg of caffeine daily may lead to health issues such as insomnia, irritability, muscle tremors, and an upset stomach. Tea has less caffeine and is generally less acidic than coffee, especially if you're frugal with your steep time. And unlike the jitters that follow being a Starbucks gold card carrier, most teas are actually proven to calm your senses and decrease your heart rate. 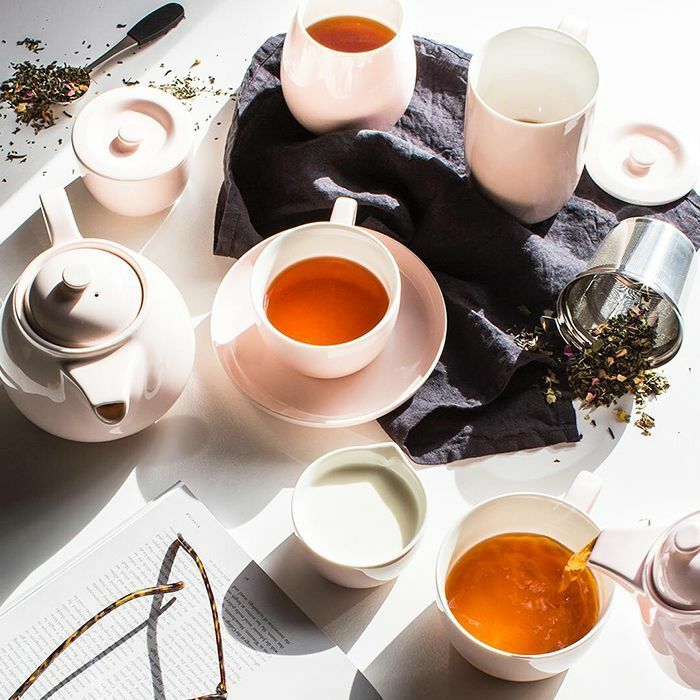 You can also get pretty crafty with tea: Sure, coffee lends itself to macchiatos, lattes, and the like, but you've got a much wider selection of flavors with tea. That's why we've put together some delicious healthy tea recipes that may replace your daily joe. Keep scrolling to find out how to make them. Spearmint is a powerful anti-inflammatory and antibacterial—in fact, drinking two mugs per day has the potential to clear your acne better than a prescription. Jazz it up with some hibiscus, raspberry, and a bit of agave for flavor. Ah, the perfect summer sip. Place the spearmint leaves, hibiscus flowers, and red raspberry tea leaves in a 1/2 gallon Mason jar or similar size container. Pour the boiling hot water over the tea leaves, and let steep for 15 minutes. Pour the tea through a fine mesh strainer into another jar, pressing on solids to extract all the flavor you can. Discard solids. Let tea cool to room temperature, and then cover and place in the fridge to chill. Add the strawberry purée to the cold tea, and mix well. Oolong tea boasts catechins, which help the body metabolize fat. In one Chinese study, participants who regularly drank oolong tea for six weeks lost one pound per week. Bring 1 quart of water to a boil. Remove from heat, and add tea bags. Let the tea brew for at least 15 minutes, but you can let it brew as long as you want. While the tea is brewing, juice your lemons, and remove seeds. As mentioned above, jasmine tea is incredibly soothing, as it's proven to calm nerves. Couple that with some antioxidant-rich green tea and stomach-settling ginger, and this drink will do your body and mind a world of good. Bring your water to a boil, and remove from heat. Remove the tea bags or tea leaves and the ginger pieces with a strainer, and place in the refrigerator for 2 to 3 hours or until chilled. Squeeze your lemons into a large glass pitcher, and pour in your chilled tea. Stir. Although not a traditional tea leaf, turmeric "tea" is a must-try for its incredible healing benefits. It gets rid of acne, dandruff, stretch marks, and so much more. Read all about it here. In a saucepan, combine the purified water with grated turmeric and ginger, and bring to a boil over low heat. Add the mint tea bags, cover the pan, and let simmer for 5 minutes over medium heat. In a pitcher, combine the orange juice, turmeric tea, raw honey, and ice cubes, and mix. Would you swap your daily coffee for tea? Tell us why or why not below!